On occasion, you may have a customer tell you that they were charged for an order, but you do not show the order in your Order History. Then, you go check the Failed Payments report and see that their credit card was actually declined (usually for address verification, though sometimes for CVV). The customer might even have "proof" of this charge in the form of a bank statement of some sort. Why does this happen and what is the best way to handle such a situation? 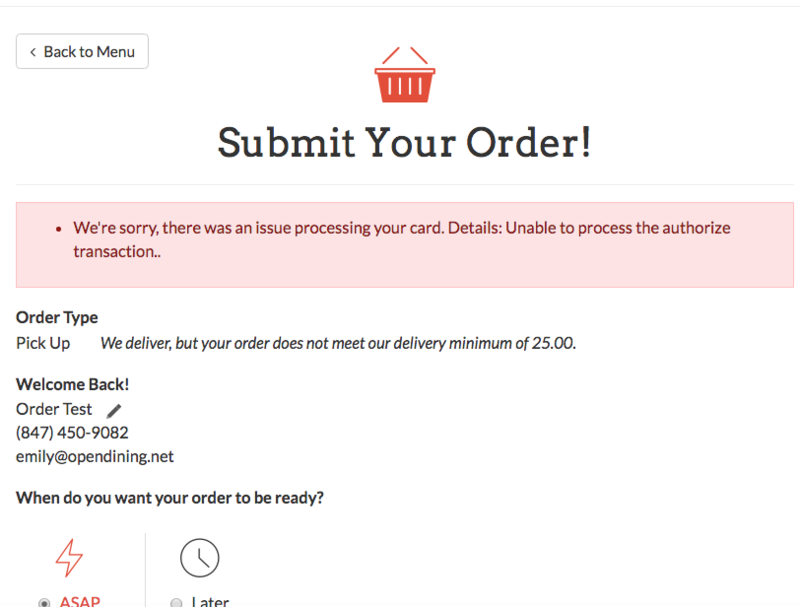 There are two things you, as the restaurant owner, should be aware of in this situation: how the back end works (why there is an authorization for a declined transaction to begin with) and the customer experience (what our system showed them at the time of the declined charge). When a customer "prepays" for their online order via credit card, their CC information is passed directly to the payment gateway that the restaurant has configured for online ordering. The gateway tells us whether or not the charge has been approved. Only if/when the charge is approved will we send out an order confirmation. The first thing that happens behind the scenes is that the gateway checks to see if the credit card number is valid and if it has the necessary funds in it. This is when you see the authorization show up on the account. If the account number is correct and the available balance is big enough to cover the charge, the authorization will show up on the individual's credit card or bank statement. Next, the gateway will go through any additional verification steps. It checks the CVV as well as any AVS fields set up (zip code, etc.). If all information lines up, the transaction is then "captured." Capturing funds is the process of actually charging the customer’s credit card for the amount of the transaction. Once captured, a transaction is "final" and would need a refund to return any money. On the other hand, if a verification step finds that something does *not* match up, the transaction may be declined. When this happens, the authorization that happened earlier will still be showing. It will fall off in a few days without any action from the restaurant, and it will never become a complete charge. It will stay "pending" with their bank. This is actually the way that most e-commerce transactions are handled. If you do a lot of online shopping, you may have come across this before on your card. This authorization is the reason why customers do not always realize that their order was not confirmed. When a customer reaches the checkout page, he/she may be given the option to choose a payment method. If they select to prepay for their order with a credit card online, they will be presented with a few fields and decisions. For instance, they may have the option to select a tip amount to add to their CC charge. They may also be asked to provide verification information such as CVV and billing address. The more verification steps they have, the more likely you are to see the issue discussed above. The rest of the page will be the same payment form that they had filled out before. So, why then, if the customer is told that their transaction was declined, do I still get these calls and confusion? Well, it could be one or more of a few different reasons. First off, in today's world, many people are multi-tasking. They might press Submit and switch to another tab, window or task with the intention of coming back. Then they get distracted and just forget to check. Also - they might see that the transaction showed up with their bank and automatically assume this means their order went through without a hitch. Another reason is that some gateways have a receipt they send out for all transactions. 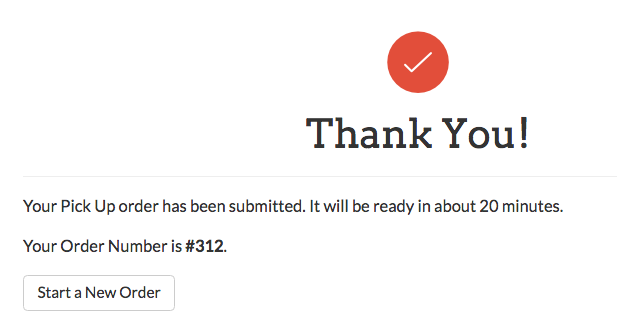 Authorize.net, for example, sends out a charge receipt with the authorization. This looks to be a receipt, especially if you are not a regular customer who is used to seeing the actual Order Confirmation receipts. It is a good idea to make sure your gateway's email customer receipts are turned off so that they only get one email receipt per transaction, directly from Open Dining with the order details on it. If your customer has experienced any of these situations, they may believe that their order went through even though our system never told them it did. We hope that this helps to clear up some of the confusion with this process. You may be left just wondering what you can do in these situations. The best thing to do is to simply apologize to the customer and explain that the "charge" is just an authorization and will fall off before ever becoming a full charge. It will stay in pending until that time. Since it is not an actual charge, no refund is needed. Many customers understand this is how it works. In fact, this probably happens a lot more than you realize, but most customers already have experience with online shopping and understand the basic process. The ones who complain are usually quite nervous about the whole thing. We recommend sending them a coupon for $5 or so off their next order. If you would like directions on how to do this, please see this article. If you have any thoughts on how we can improve this process and make things easier for you to explain the situation to your customers, please let us know.